In the midst of a long, hard night of studying, it is easy (and very likely) to become frustrated, tired, and irritated. After losing the ability to focus, students often start to fall asleep—and that’s where the problem begins. All of that studying can go down the drain because one did not prepare properly! They say that once you pop, you just can’t stop—and the same goes for sodas. Young adults and sugary sodas are a bad combination. Not only are sodas bad for the teeth and the body, but they also deliver a dehydrating, jitter-inducing caffeine boost and sugar rush that keeps one artificially alert—momentarily. What if there was another way? What if students didn’t have to slurp sodas and down energy drinks to stay awake before that big final? When it comes to food, it is important to realize that most processed snacks and quick fixes will get students nowhere; while grabbing a bag of chips from the vending machine sounds like a good idea at the time, students will realize their mistake when their stomach begins grumbling again in 20 minutes, breaking their ability to focus. Avocado is considered “brain food.” The heart healthy monounsaturated fats and fiber will not only keep students fuller longer, but they will also boost blood flow (and yes, that means your brain will feel better, faster, and smarter). Go ahead, mash up an avocado and make some fresh guacamole; serve it with carrots and bell peppers to get ready for a great night of studies! Be sure to drip a little olive oil in the mix, too, to boost the level of healthy, monounsaturated fats! 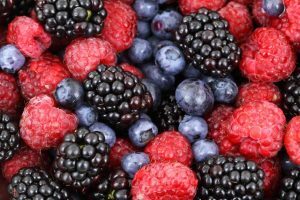 Blueberries, strawberries, and other berries have been linked to slower cognitive decline over time. This long-term effect is a bonus because berries and other fruits can help students studying today! The secret is in the sugar, which can help energize students, giving them the ability to make it through that last chapter before bed. Please note, however, that table sugar does not deliver the same effect as the natural, unprocessed sugars found in fruits. Glucose is every student’s friend. Grab a blender and make a sweet smoothie to curb sweet tooth cravings, while promoting smart study habits! Although citrus is obviously considered a fruit, these sweet, tart treats deserve a mention of their own. Citrus is a naturally awakening, energizing food that will help students trudge through another hour of studying, without feeling the pain and frustration that often come along with late night studies. Grab a grapefruit, or opt for an orange to satisfy study time cravings. Salmon, Sardines, and Mackerel — Oh My! Fish is very high in omega-3, which is a crucial component for brain function. While most fish have this nutrient, fatty fish such as salmon, sardines, and mackerel offer it at exceptional levels. This nutrient has been found to improve focus and memory, so snack on some salmon before sitting down to study! Walnuts produce high levels of alpha linoleic acid, which is vital for brain function. Why is it so important? Like avocado, walnuts improve blood flow, therefore optimizing oxygen delivery to the brain, and accelerating study skills! Additionally, the protein found in walnuts will keep students full, curbing various cravings. Students will be surprised by how often thirst is masked as hunger. Surprisingly, humans often have difficulty detecting the difference between the two; when one’s body is searching for sustenance, it is important to provide it with what it is truly asking for. Not to mention, dehydration can affect cognitive function and ability. Before grabbing a snack, enjoy a fresh glass of water; it might just help one achieve the balance and satisfaction he or she was looking for, and as beneficial as water is, it doesn’t hurt to have an extra glass! It will be refreshing and alerting, offering students a greater ability to focus by enhancing hydration. Healthy Food is Brain Food! All in all, one of the most important things that students should remember is to limit the intake of junk foods by not buying them in the first place! You cannot eat what is not there—but if it’s already in your apartment, you are way more likely to eat it. Stock up on fresh fruits, whole grains, and lean meats, and you will feel fresher and more alert during your studies. A final tip: smaller portions of snacks are equally as satisfying as larger portions. Review this study detailed by Cornell’s psychology department. FNU cares about each student that trusts us with their education—that is why we want to do everything we can to help boost your brain function and studying! If you are interested in learning with FNU, review our online programs, and apply today!